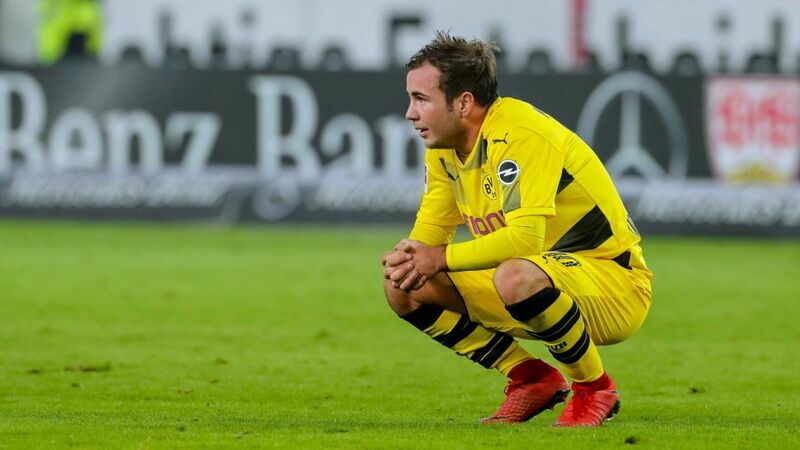 Bundesliga | Borussia Dortmund's Mario Götze after Stuttgart defeat: "We need to turn our talk into points"
Borussia Dortmund's Mario Götze after Stuttgart defeat: "We need to turn our talk into points"
Another Matchday, another defeat for Borussia Dortmund. There was plenty of optimism that Die Schwarzgelben would put an end to their poor recent run at VfB Stuttgart on Matchday 12, and that the international break would prove the perfect tonic for the club's ills. It did not quite work out that way. Shorn of Pierre-Emerick Aubameyang and Christian Pulisic, and then going behind after a defensive mix-up between Marc Bartra and Roman Bürki after four minutes, Dortmund were always on the back foot at the Mercedes-Benz Arena. Maximilian Philipp levelled on the rebound from Andre Schürrle's missed penalty just before the break, but Josip Brekalo's 51st-minute strike put paid to any Dortmund hopes, making it five Bundesliga games without a win. bundesliga.com caught up with Mario Götze in the mixed zone to get his thoughts on the defeat in Stuttgart, how his side can turn their current form around, and the upcoming meetings with Tottenham in the UEFA Champions League and Schalke in the Revierderby. bundesliga.com: Mario Götze, what were the reasons for Borussia Dortmund's defeat in Stuttgart? Mario Götze: If you go behind to a mistake as we did, then things become difficult. We need to cut those mistakes out as quickly as possible. It wasn't good for us to have to change how we wanted to play almost immediately. Then, just before half-time we levelled, but conceded again straight after the break. That was a bit of a kick in the teeth. bundesliga.com: How would you assess the defeat then? Götze: Losing in Stuttgart is pretty tough to take. bundesliga.com: Can we talk about a crisis at Borussia Dortmund? Götze: If you look at recent results, and then the defeat here [in Stuttgart], then it's certainly not what we hoped for. bundesliga.com: In the first half you played well, despite going behind, although you played less well in the second half. Was that to do with going behind early on again? Götze: We really wanted to impress and I think you could see that we really wanted to win. We had a lot of chances and found space well – that was important for us. That said, we wanted three points and unfortunately we couldn't manage to get them in the second half. Götze: That's correct. We weren't decisive enough in front of goal. bundesliga.com: How do you turn this around? Götze: We need to sit down together and then find solutions on the pitch. Then we need to turn our talk into points.